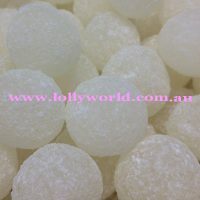 Mega Sour Lemon Balls are sweets so sour they come with a warning! In the shop over the time we have been open only a handful have successfully kept one in one’s mouth until all gone. They are pretty sour. Coming in a packet of 12, each is roughly 2cm in diameter. Made by Barnetts in Great Britain they are gluten free and suitable for vegetarians. Are you game enough to take on the Mega Sour Lemon Ball?